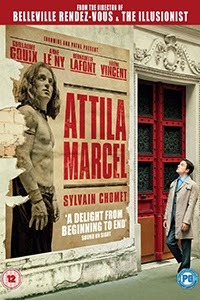 Sylvain Chomet’s feature-length foray into live action, Attila Marcel (2013) sees him making stylistic nods to the auteurs of his homeland – think Tati, Jeunet and Gondry – while maintaining his own sense of whimsical tenacity that has become a hallmark of his trade. Chomet has made a name for himself in constructing animated worlds that hearken back to the glory days of cartoonish delight. Indeed, his previous works, The Triplets of Belleville (2003) and The Illusionist (2010), have been praised for their surreal charms and comforting qualities. But while Attila Marcel is altogether a saccharine diversion, it fumbles with tone and direction. Oddly, Chomet seems to have put an emphasis on panache rather than payoff. The unlikely hero at the core of the story is mawkishly mute Parisian pianist Paul (Guillaume Gouix). After the death of his mother, Paul was taken in by his two spinster aunts and spends his days watching them instruct meek students in dancing as he accompanies on the ivories. A thoroughly intoxicating meeting with his neighbour, Madame Proust (Anne Le Ny ), an at-home apothecary and psychiatrist of sorts, leads Paul to seek out her services in order to search his memory for clues as to what fate truly befell his mother. Afternoons are soon being spent drinking spiked herbal tea and fading into extended musical sequences that hold piecemeal keys to Paul’s muteness and heritage alike. Attila Marcel is replete with slightly off-kilter oddities, from identically dressed spinster aunts to the mute anti-hero to the shrill musical numbers that cut into the plot rather sharply. The aim may be to spin a yarn of cartoonish sweetness in an attempt to veil some more adult realities, but there is a sharp tonal disconnect. In one of Paul’s memories, we watch as he sits in front of the television as a children’s programme is playing. Instantly, the characters are in his living room while off to the side the camera shows us Paul’s father (the eponymous Attila) choking his mother. The film then glides back to present day, shifting from Gondry to Jeunet, moving the dial of jarring weirdness back to a semi-sustainable level. These sorts of tonal (or tone-deaf) movements between absurd comedy and equally-surreal drama seem to zap any possibility of depth or connection to the stakes at hand. It is Anne Le Ny’s performance as the free-spirited, stable Mme. Proust that is at the heart of the film, enjoyably serving as the spirit guide of sorts of Gouix’s constantly expressionless Paul. Le Ny is a firebrand onscreen; her performance is able to stabilise a film the otherwise shifts endlessly. It’s a real shame that Attila Marcel never seems to quite find its footing. There’s some admirable traits at its core (typically for Chomet it’s charming, silly and even endearingly macabre) and its quest to situate itself as a surreal coming-of-age story is often unseen. But the magic, rather than drawing viewers in, seems to hold them at a distance.